Although today Malbec has achieved global adoration, the variety was something of a mixed success story in times gone by. In Old French the name means something like “bad beak” or “bad nose”, which may have been a reference to the French dislike of the wine’s smell. Another popular nickname was the “black wine ” owing to the deep purple pigment Malbec tends to leave on your lips and tongue. Despite this risk of a stained mouth, French Malbec was very popular in the medieval period and beyond, and it is only in more recent times that French production has contracted. The real problem was not the Malbec variety itself, but the climate in which it was being cultivated. In Bordeaux, where the weather is frequently rainy and cool, Malbec cannot be made as a single varietal as its fruit struggles to ripen. The tendency of the grape in this climate is to produce highly tannic and inky violet-coloured wines which lack aromas. A grey day in Saint-Emilion, Bordeaux. Image source: Ernmuhl via Wikipedia. Despite all its disadvantages, French winemakers in the Médoc recognised the potential of Malbec; it is said to have been widely planted in areas like Saint-Émilion in the 18th century and there is evidence that Chateau Latour was using Cabernet Sauvignon and Malbec as its two main noble grape varieties in the early 19th century (according to Charles Higounet’s book La Seigneurie et le vignoble de Chateau Latour). Before the 1860s, Malbec accounted for around 60% of the legendary Chateau Cheval Blanc vineyard. Malbec was commonly used in the place of Merlot in blends with Cabernet Sauvignon. Today, just as in the past, the variety is still used in small quantities in classic Bordeaux blends alongside Cabernet Franc, Cabernet Sauvignon and Merlot. The blatant difference between then and now, though, is Malbec’s dramatic decline in prominence here. The Malbec vine is rather sensitive and picky when it comes to being cold and damp. This, of course, means it’s not a great match for the Bordeaux climate (there are better places to top up your tan). The Bordeaux Malbec vines were often susceptible to disease and rot. When the Phylloxera epidemic decimated French vineyards in the second half of the 19th century Bordeaux Malbec was devastated. Huge numbers of vines were destroyed and attempts to use American rootstocks met with difficulty as the Malbec struggled to adapt to the more vigorous rootstocks. On top of this, in 1956 a severe frost killed off around 75% of Malbec plantings in some French winegrowing areas. The outcome of these unfortunate events was a loss of enthusiasm for Malbec in Bordeaux. Malbec vines have been largely ripped out and replaced with vines that better suit the cool maritime climate. Today Bordeaux blends may have at most 10% Malbec, if they contain any at all. Outside of Bordeaux the story of French Malbec isn’t all doom and gloom. Remember what I said about Malbec having such a mixed success story? There is one crucial region in France which still produces fantastic wines using 100% Malbec – Cahors in the French Sud-Ouest. Here, in the historical birthplace of Malbec, the variety is also known by two local names, Côt and Auxerrois. This is the Malbec which attained such popularity during the medieval period; it was served at the wedding of Eleanor of Aquitaine and Henry of Anjou (who would later become Henry II of England) in 1152. It was also much sought-after in medieval England, and it also caught the attention of Peter the Great who had the variety planted in the Crimea. Chateau Chambert in Cahors. Image source: Chateau de Chambert via Wikimedia Commons. In contrast with Bordeaux, the reduced rainfall and light Atlantic breezes in Cahors help to prevent rot and disease. The grapes benefit from a warmer climate and the vent d’autan, a hot and dry wind from the south which assists ripening. Malbec vines here tend to develop thick skinned-grapes which give deep colour and intense tannins to the wines. These powerful wines frequently benefit from significant periods of ageing to soften their tannins before they are ready to be enjoyed. For AOC Cahors up to 30% of another variety is permitted so Malbec blends are also made using Merlot to soften and add roundness and Tannat to boost the wine’s ageability. Young fruity Cahors Malbecs often respond well to charcuterie to take the edge off the tannins and the tart blackberry flavours of the wine. Wines which have seen significant ageing suit red meats and game. Locally they are often paired with Cabécou, a soft goats cheese which is dipped in plum brandy and sprinkled with black pepper before being left to mature inside chestnut leaves. The slightly tangy flavour and creamy character make an interesting match for the complexity of an aged Cahors Malbec. A Cahors Malbec. Image source: Dominic Lockyer via flickr. Although heavily damaged by Phylloxera and the general fall in wine consumption in traditional wine producing countries like France, Cahors Malbec is once again on the up. In response to that other unmentionable place where they produce phenomenally successful Malbec (Argentina, of course), the region is currently going through a publicity drive to raise the profile of the original black wine. The focus here is on quality since Cahors has only 3500 hectares of Malbec. Producers are even (and this is so very un-French it may even be unpatriotic) putting the varietal name, Malbec, on the label. Let’s hope their efforts and their bold break with French winemaking tradition pays off (I certainly wouldn’t want to risk the traditional French winemakers’ wroth without the promise of significant reward). 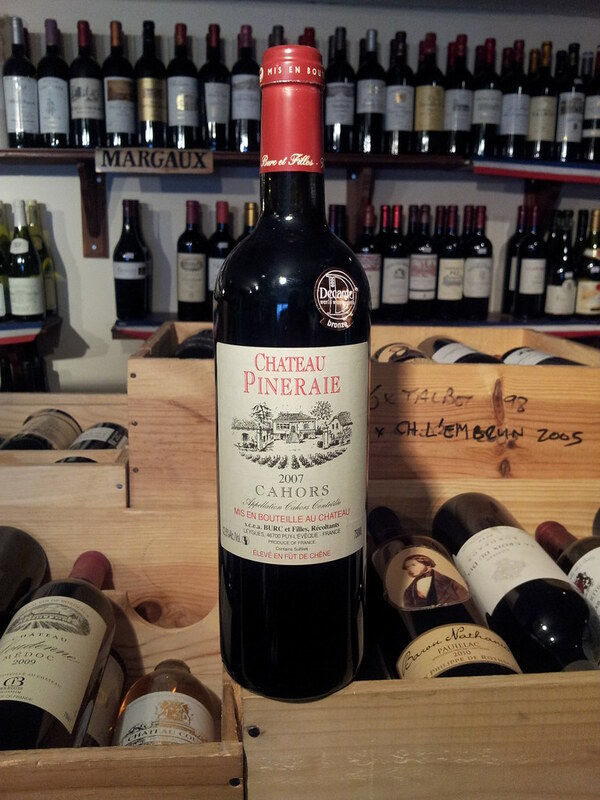 Have you tried any great Malbecs from Cahors? Let me know what you thought. You mentioned an alternate varietal name, Auxerrois. I’ve just written a piece about that grape (blanc) in Alsace. Learned a lot and was very interested. Tasted damn good too. I hadn’t realized there is a rouge. The grape has got my attention & I’m curious! Thanks so much! For my part I didn’t know about the Alsace blanc so I will have to check out your piece. Very good, interesting piece. I think Cot is at its best when that dollop of Tannat and Malbec are blended in. Are the clones in Argentina very different to those left in Bordeaux and Cahors? Yes, I tend to agree. It can be a bit over the top overwise, in terms of tannins. As for the clones, apparently the clone brought over to Argentina has since disappeared from France. In general vines here give smaller grapes and tighter bunches than the Cahors Malbec. So this could account for the very different wines Malbec gives in Cahors and Argentina. Thanks for a great comment and question!